How Thick Should Concrete Steps Be? Concrete is a long-lasting, permanent installation if poured into a well-constructed form over a properly prepared substrate. Applications such as sidewalks, patios, shed slabs and steps do not require a great deal of concrete or concrete reinforcing bar (rebar) in most cases. However, the concrete must be thick enough to withstand weathering and foot traffic. The thickness of concrete steps varies from front to back, mainly because it's easier to pour that way. Concrete steps to a house or walkway should be attached by rebar. Holes are drilled into the existing concrete slab or concrete foundation walls and rebar is epoxied into place. When the concrete is poured, it effectively becomes a part of the existing structure. The step risers and treads must meet building code requirements. Local codes will vary on what is allowed but most departments accept the standard building code. Step rise must be between 6 and 8 inches, tread length must be at least 9 inches. Some codes specify a formula to allow for various riser heights and tread lengths, with a maximum riser height. Riser plus tread equals 17 inches is one common formula. Another is two times the riser height plus the tread length equals 24 inches. Since forming a nose on concrete steps is difficult, some codes require the concrete risers to angle back below the step they are under. Consult your local building code enforcement department before beginning construction and obtain any permits necessary. Make the forms for concrete steps of 2 x 6 or 2 x 8 lumber ripped to the riser height. These are nailed together and fastened to stakes anchored in the ground and to the structure to which the steps are to be attached. The weight of the concrete dictates that the forms are also braced in place. 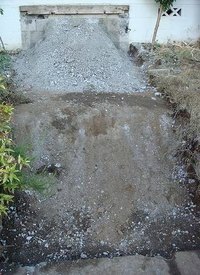 Use sand or gravel as fill when more than a single step is being built. At a minimum, the thickness of each step at the front will be the riser height plus 4 inches. At the rear of each step, and at the sides, the minimum thickness is about 4 inches. Order pre-mixed concrete when the steps are large enough to use a full cubic yard of concrete or more. Large stoops and walkways that incorporate steps are examples of this. It is important to pour the entire job within a short period of time, so that all the concrete sets together into one piece. Start at the bottom and work up. Once the concrete is poured, use a 2 x 4 to "screed" off the excess, working the 2 x 4 back and forth across the forms. Be sure any voids are filled. Don't bring too much "cream" to the surface, which might cause the concrete to flake. Just work it enough to make the surface smooth. As the concrete sets, smooth the surface with a float. Use an edging trowel to round the edges of the concrete steps. A small, stiff brush like a whisk broom can be used to put a non-slip surface on the concrete, dragging it across the almost set-up concrete after it has been smoothed to barely groove the surface.